With my departure date for two months in Greece looming, my teensy 45L Kathmandu backpack comes out of its dusty storage place to mock me with it’s inadequate size. Too big to check-in, too small to house my ever increasing belongings: it is the perfect size to encourage bag-sitting and zip-straining (this is why I can’t have nice things, they get broken). Although I complain, I do love my backpack, it keeps my shopping habit under control and I sometimes feel smug when eyeing other people’s gargantuan luggage. Smugness aside, I thought I would share my packing list for a summer in Greece. 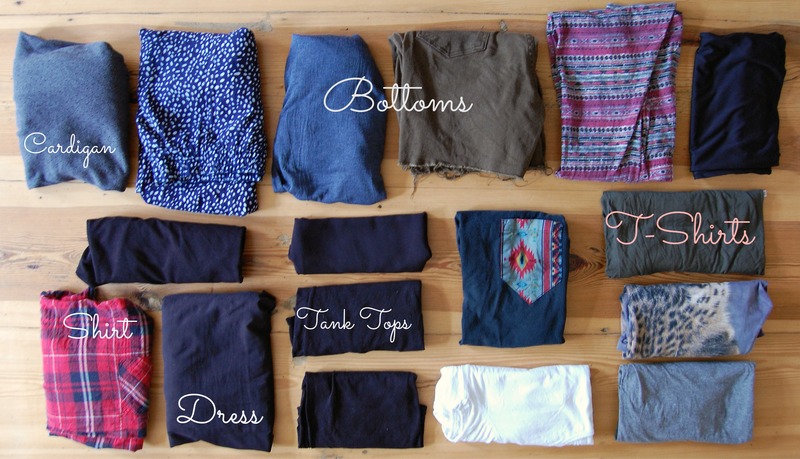 Although I’m going to Greece, I think this packing list would be suitable for any summer destination. This post will address clothes, shoes, accessories, gear and electronics. See this post for toiletries and makeup! I also promise in this packing list that there will be nothing beige, nothing that zips-off and most certainly nothing that is quick-dry, fast-wicking, mosquito-repellent infused, odour eliminating or reversible. Not that I have anything against these things, they just happen to be a little bit expensive and more than a little dowdy. Within my main bag, I keep everything separated with packing cubes. I have a double sided one from Kathmandu which I keep my clothes in, a random one from Ikea for underwear and socks and a bunch of smaller bags for everything else. I also have a couple of waterproof bags (the ones with the roll down tops) which come in handy for keeping precious things dry. Alongside my main bag, I carry a Herschel backpack as my carry-on luggage with a small cross-body bag tucked inside. The Herschel bag was a graduation gift from my parents and is definitely more stylish than practical. Although it does have an inbuilt fleecy laptop sleeve that my macbook air tucks neatly into. My cross body bag was a flea market find (3 Euros!) and holds all my most important things: passport, phone, sunglasses, wallet and a couple of small notebooks for everyday note-taking. I try and keep all my clothes to a colour scheme of grey, white, black, khaki and denim but a bit of blue has crept it’s way into my bag this time. I am going to Greece after all! Shoes glorious shoes! Trying to narrow it down to three pairs is hard but I believe these cover all bases. If you had a little extra room, I would throw in another pair of flats. 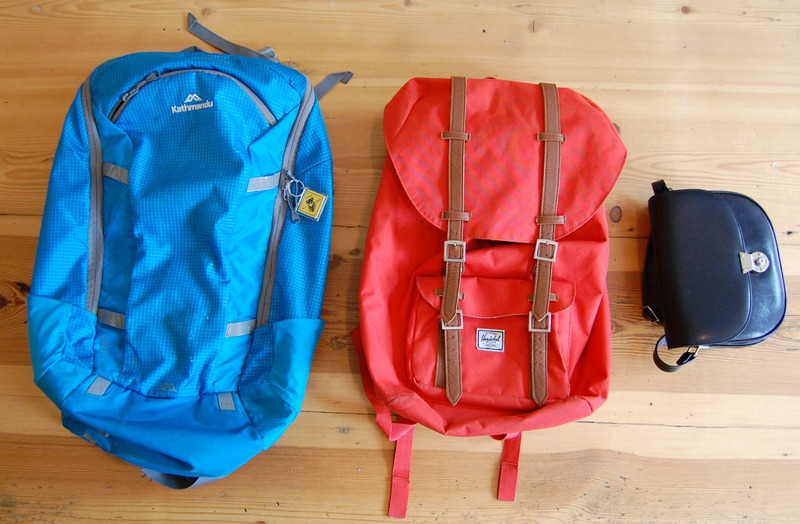 This is where we are getting minimal, 45L backpack remember! – I normally also take basic snorkelling gear everywhere with me (a mask, fins and snorkel) but I ended up sending those things home when I moved to Germany but if you are a diver/ocean lover then I recommend carrying at least your mask with you. There is no doubt I am missing something! Be a kind traveller and let me know. 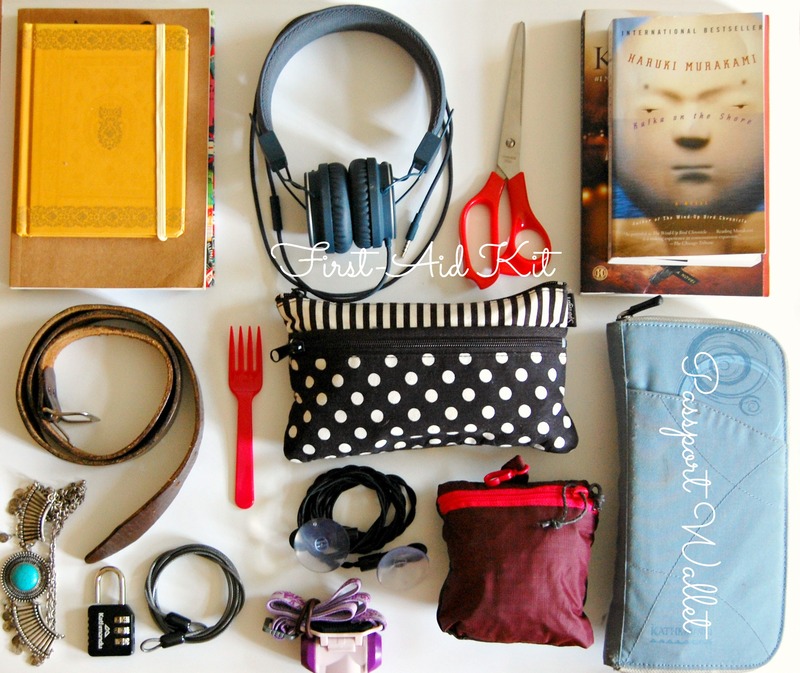 While you’re at it, what is one thing you can’t leave home without? Leave a comment or email me at dirtypawsblog@gmail.com. You’re missing the large cotton scarf that can double as a sarong, bed sheet, curtain, picnic blanket, table cloth, head cover etc. I never travel without one and it always comes in handy. I’m actually envious of your 45l backpack! I;ve been looking everywhere in Beijing for a decent 35-45L backpack and can’t find one anywhere! They are all either too big, too small, not women friendly (I seem to have a short body so i need the female friendly frames!) or soooo expensive because the import tax is crazy here! I wish I had got one before moved here. Anyway, good packing post! You’ve reminded me I need to pick up some packing cubes (and err a backpack) before I head of next Thursday! My backpack is about that size too. It worked great for actually backpacking because I can strap gear (sleeping mat/tent) to the bottom but I don’t want to strap things to do it while I’m traveling… there would be no way to keep it safe. You’re so organized with your list!